okay, i am a bit blah on the summer knitting, what with it getting cold again. but, as a relief from the horrors of endless navy blue linen stockinette, i am tackling the charts for the to catch a thief top. i started from a photo of the top - the biggest, most hi-res one i could find - blown up and printed out. 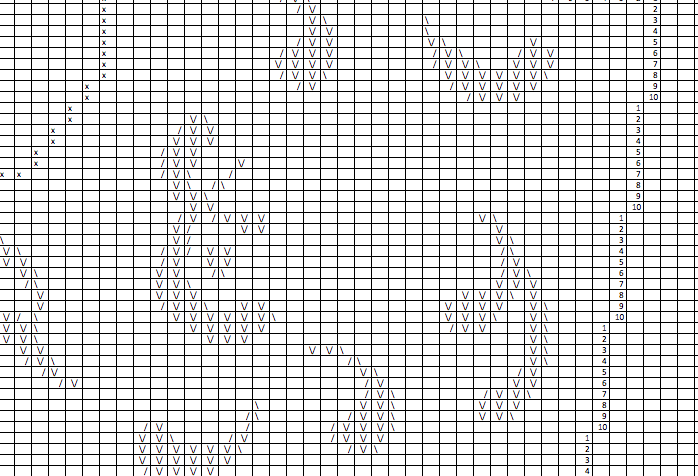 notice that the pattern is basically symmetrical, so i'm just working with half of it. i've gone over the outlines of the individual paisley motifs (or "paisles" as my sister and i called them when we were kids) in pencil, and then drew a rough graph over the printout to guide placement. then i printed out a chart of the basic shell, and sketched the paisles on it roughly. once i had them in approximately the right place, i started converting the outline to "stitches" following the chart lines. you'll notice some of those are half-wide stitches: you can do that with duplicate stitch! 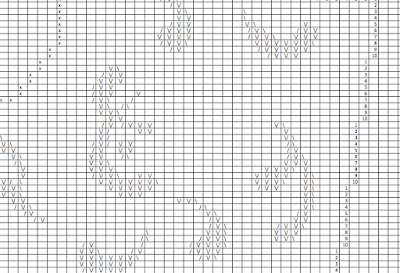 you get a slightly "higher resolution" pattern that way. next step is transferring it back to the chart file. i will need to tweak the placement of a few of the paisles i think, but that's easy enough to do by simply copy-pasting. the whole process does feel like it will last well into next summer though! Linnen - nice, but oh you kid! is it really summer? almost?